Diabetes can develop in older adults as the body becomes less sensitive to insulin and can no longer metabolize glucose properly. Excessively high levels of sugar in the blood can lead to nerve damage, slow healing, and a variety of other issues. Even when it is properly treated and managed, diabetes can cause a lot of health risks. Try the following easy tips to lower your senior loved one’s diabetes risk. Sugary beverages increase a senior’s diabetes risk. Even things that seem healthy, like fruit drinks or teas, can be very high in sugar. To avoid these beverages and drop weight without even trying, seniors should try to focus on drinking water instead of sodas or juices. Seniors who don’t enjoy plain water can try it with unsweetened herbal teas or flavorings. Switching to healthy drink options may be difficult for some older adults. If your aging loved one needs help managing everyday tasks or encouragement to adopt healthier lifestyle choices, turn to Home Care Assistance, a leading provider of home care. Huntsville Home Care Assistance provides professional in-home caregivers around the clock to help seniors live longer, happier, and healthier lives. One of the biggest risk factors for diabetes is obesity. Losing even 10 pounds can reduce a senior’s chances of developing diabetes. One of the most effective ways to lose weight is to eat fewer calories than the body burns in a day. Apps like MyFitnessPal make it easier to manage weight. To make sure your loved one is not hungry on a low-calorie diet, include plenty of fresh fruits and vegetables that fill him or her up without adding on calories. Physical activity is an essential part of reducing diabetes risks. In addition to helping your loved one lose weight, exercising also boosts insulin sensitivity. Seniors who do not have the stamina for difficult exercises can still benefit from gentle yoga, aqua aerobics, or walking. 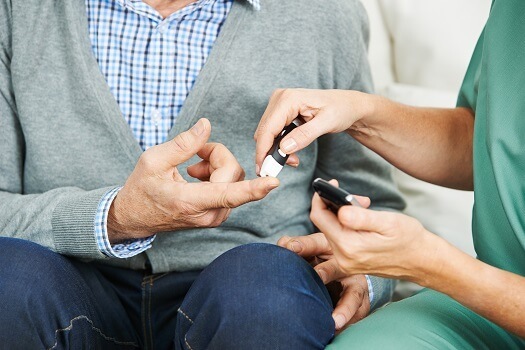 Anything that gets your loved one moving can help his or her body burn blood glucose for energy instead of letting it stick around and cause damage. Many seniors have difficulty engaging in physical activities. Huntsville home care professionals can be a wonderful boon to seniors. Whether they require around-the-clock supervision or just need assistance with exercise and household tasks a few days a week, seniors can enjoy a higher quality of life with the help of trusted in-home caregivers. Consuming a lot of sugar-rich items can cause blood sugar to spike and slowly lead to insulin resistance over time. Therefore, it’s very important for seniors to eat a diet low in sugar. Keep in mind sugar can be present in a surprising number of things, including dried fruits, breads, crackers, and cereals. Try to read labels and keep an eye out for hidden sugar. Fiber reduces diabetes risks because it slows absorption in the stomach and intestines. You can add fiber to your loved one’s diet by serving meals with crunchy vegetables, whole grains, beans, and seeds. Diabetes can affect a senior’s ability to perform the tasks of daily living. Whether your elderly loved one needs part-time assistance with basic household chores or you need a break from your caregiving duties, the Huntsville respite care experts at Home Care Assistance are here to help. All of our respite care services are backed with a 100% satisfaction guarantee, there are no hidden fees in our contracts, and we never ask our clients to sign long-term contracts. Call us at (256) 716-9940 today to create a customized in-home care plan for your loved one.